I know this is a touchy subject, and if I were a “smart politician” it might be smart for me to avoid this subject altogether. But the entire point to everything I’ve said on my campaign site here is that I want you to know who it is you’re voting for, what I stand for, and most importantly, why I stand for these things. As your elected representative, I will stand for what I believe is right, and I would not be the right person for the job if I started avoiding touchy subjects before I even won the election. We absolutely need police. This section is not about “hating police” or even “not supporting” them. I believe it’s the opposite. This is the kind of support good police officers need from us. Because we absolutely need people who are willing and able to investigate crimes, arrest criminals, and help to keep our communities safe. I don’t believe this is even questionable. But I do believe that the polarization surrounding policing has contributed to an “us vs. them” mentality, both in law enforcement as well as in the communities they serve. It’s dangerous. It’s dangerous for the law-enforcement community, and it’s dangerous for civilians. The first thing I’m going to do here is lay some ground work of information that you need to know in order to understand the hows and whys of what I think needs to be done to make policing safer for everybody. I grieve every fallen officer. This is why I believe these things in this piece need to be addressed. The way policing is being handled today is making it more dangerous for all of them. People are increasingly seeing police as the enemy, and it's not the fault of the media, or politicians. It's due to the policies within police departments nationwide. I need to preface everything I’m about to say here by emphatically stating that it’s never okay for police officers to be killed or injured in the line of duty. It’s not something I would ever wish for. Every death of a police officer – or, truly, every death of any person, not a result of natural causes – represents a failure somewhere, and heartbreak for the family and friends of the deceased. It’s always tragic, and I always feel terrible for the people left behind. It’s a little-known fact, but the number of officers intentionally killed in the line of duty has been hovering at or near historic lows for at least a decade now. I’m only counting officers intentionally killed, not car accidents, heart attacks, etc., as those are simply a part of modern life. In regard to homicides committed against officers, the lowest number of officers killed in a single year, ever, came in 2013 when 36 officers were tragically killed (34 shot, 2 stabbed, 0 beaten, 0 strangled). So, while there are often dramatic headlines like, “U.S. Police Officer Shooting Deaths Up 56 Percent in 2014: Report,” we all should remember that the 56-percent increase is from the lowest number ever recorded (34) in 2013, up to 50 in 2014. Again, all 34 in 2013 and all 50 in 2014 were tragic, and none were justifiable as far as I’m aware. I’ve never even heard of a police officer being justifiably killed by a civilian. From 2007 through 2016, the highest number of police officers shot to death on duty was 73 in 2011. That was a particularly violent year, apparently, as there were also 2 officers stabbed to death, 1 strangled to death, and 2 beaten to death, bringing the total all-told to 78 officers tragically and mercilessly murdered by civilians. But the problem with numbers that are this historically low is that any variation from one year to the next means a massive statistical shift in terms of percentages. From 2007 to 2008, there was about a 37% decrease in officers murdered in the line of duty, for example, but it was only a drop from 70 to 44. The numbers are too small to look at using percentages, especially when you consider there are roughly 800,000 sworn police officers in our country. Frankly, as someone with friends in law enforcement, but who has never had the desire to become a police officer, the rhetoric about violence against police just strikes me as irrational, and it’s usually coming from the law-enforcement community. Despite the historically low number of officers killed during the Obama Administration, for example, the law-enforcement community was pushing partisan propaganda stating the opposite without any facts to back it up. Those two stories I just linked to there came out less than two months apart! And while law enforcement has been overstating the dangers of their job, they’ve been under-reporting the number of people killed by law enforcement. Between June of 2015 and May of 2016, the FBI and Bureau of Justice Statistics believe at least 1900 “Arrest-Related Deaths” (ARD) occurred (at the top of page 2 here). That’s an average of 158 per month. A review of three particular months of data showed that some of these deaths were classified by the departments as suicides or accidents, which the FBI says still falls under the responsibility of the department, since civilian safety while in custody is the responsibility of the arresting agency. But even if we assume the numbers are completely accurate, which not even the FBI is assuming, it still leaves over 1200 confirmed homicides at the hands of police every year (or over 100 per month). This is never a good idea. Ever. For anybody. Anywhere. My mother is practically a saint, but I wouldn’t trust her to investigate herself, nor would I trust anybody else. Police are just as human as any of us, which means they’re just as likely to make mistakes as any of us, and none of us are perfect. But when a civilian makes a mistake that costs somebody their life – for example, a split-second decision to drive through a yellow light, which turns red, resulting in the driver hitting and killing a pedestrian – the civilian will be held legally accountable. It’s not a matter of punishment for the civilian as much as it is a matter of justice for the deceased and their family and friends. It’s how a country that truly has “liberty and justice for all” must operate. Accountability and justice like this is severely lacking in our country when law enforcement officers make fatal errors. For example: In the state of Wisconsin, they formed Police and Fire Commissions back in 1885 whose job it is, in part, to determine whether or not officer-involved shootings are justified. They’re made up of police officers and firefighters from the communities over which they reside, and the commission members are elected to three-year terms by their respective department personnel. Would you believe me if I told you that, since 1885, throughout the entire state of Wisconsin, there has never been an officer-involved shooting that was determined by the department, a Police and Fire Commission, or a coroner’s inquest to be unjustified? Now, ask yourself, what are the odds that every single officer-involved shooting over the course of about 130 years was completely justified? That not a single officer ever accidentally shot the wrong person, or made an incorrect judgment call, for over a century? And that’s the kind of injustice people are running into all over the country. Despite the data I’ve cited already, showing the massive numbers of civilians killed by police every year, police almost never see the inside of a jail cell. On average, there are usually only about 5 officers charged per year with criminal offenses related to on-duty behavior, and very few are ever convicted. In 2015, there was a surge in officers put on trial, but despite 18 officers tried, none were convicted of a crime. 1) It’s law enforcement’s job to gather the evidence for any trial, and if they simply aren’t very motivated to gather it, the prosecution will have weak evidence. Nearly all of the 13 jury convictions mentioned above included video evidence. And it also frequently falls on police officers to testify in trials against other police officers, which makes things difficult for the prosecution as well. 2) This is the most important part to understand: District Attorneys and prosecutors have to work hand-in-hand with law enforcement every single day. Law enforcement writes the reports, collects suspects and evidence, and testifies in court at the request of prosecuting attorneys. Because of this necessary, usually friendly relationship, prosecutors are often not truly motivated to convict law enforcement officers, because when they really try, things can become difficult for them. From fallout between prosecution and police in Baltimore, to New Mexico, where the Albuquerque DA became the target of a police investigation after mentioning to the chief that she was leaning toward filing charges against two officers who used rifles to shoot to death a homeless whose crime was “illegally camping.” His name was James Boyd. You can watch the shooting here if you want. It seems obvious to me that Boyd was suffering from some sort of mental illness. And investigating the DA wasn’t the only thing Albuquerque PD did her. She ended up resigning in 2016. You can read the full story here. These are reasons why prosecutors often will not dutifully try a case against police officers. These two headlines came out the same day. An officer who shot a man to death who had done nothing wrong and was obeying commands was acquitted, while a civilian woman who told her suicidal boyfriend to go ahead and kill himself was convicted. Justice is supposed to be blind. It isn't. In recent times, prosecutors have begun charging officers with crimes that don’t fit what actually happened in order to get the officers acquitted on a technicality. In 2015, Chicago PD officer Dante Servin was charged with involuntary manslaughter for an off-duty shooting. Upon reading the verdict, Judge Dennis Porter ruled that since shooting someone intentionally is not “involuntary” he had to acquit Servin because Servin should’ve been charged with murder. More recently, there was an acquittal in the shooting of Philando Castile in Minnesota by St. Anthony PD officer Jeronimo Yanez, who shot Castile multiple times as Castile reached, as instructed, to get his wallet and provide Yanez with his ID, while simultaneously explaining he had a concealed-carry permit – which he was required to do by law. Yanez was charged with second-degree manslaughter, which as you can see also did not fit the circumstances. Even worse, once he was acquitted, he was fired from the St. Anthony Police Department and received a $48,500 golden parachute. I believe these trials are often intended to give the illusion that justice is being done. And I firmly believe that injustice for one person in our society is injustice for all of us. This one is straightforward: Civil Asset Forfeiture laws were instituted as part of the fight in the War On Drugs (which I believe should be abolished anyway), and they allow law enforcement to seize your property just based on the suspicion that the property is linked to criminal activity. Since it’s based on civil law, rather than criminal law, law enforcement can legally take any cash you have on you, as one example, and since the asset itself (which can be cash, a house, a car, a boat, or just about anything) is what is being legally accused, if you will, there’s very little recourse for us to get our property returned to us. People whose property is taken through Civil Asset Forfeiture are often never charged with a crime, or even arrested, the property just gets taken, and then the only way to get the property returned is to go to court and prove a negative – prove that the property was not garnered through any illegal means – and that can be literally impossible to do because the burden of proof is shifted to the accused. This is just about as unconstitutional as it gets. And before you say, “Well, it’s not that much of a problem, is it?” Over the last three years, property taken by law enforcement through Civil Asset Forfeiture has cost Americans more than all burglaries combined during the same years. If you want to laugh while you’re angry about this, here’s a bit HBO’s John Oliver did on this subject in 2014. It’s really informative as well. Thankfully, as Californians, this isn’t a problem for us, as Governor Brown signed a bill in September of 2016 that made Civil Asset Forfeiture illegal unless it is accompanied by a criminal conviction. It’s nice when your state gets something right for once, huh? And it was just in time, too, because President Trump’s Attorney General, Jeff Sessions, announced in July of 2017 that he plans to increase Civil Asset Forfeitures. None of us get to vote on what the penalty is going to be for any sort of traffic or parking offense, but as I point out elsewhere, our local, state and federal governments can often treat us as if we’re bottomless pits of endless cash. The problem is, things like gasoline taxes and traffic citations disproportionately effect the poor and middle classes. Here’s a great column from the LA Times about the situation here in California, where a $100 ticket will end up costing $500 about 80% of the time. This 400% increase in fees has helped the California state government to bring in billions in additional revenue. When a government can levy such high surcharges, based on fines that we have no choice about as citizens, essentially writing their own checks, that’s the definition of extortion. And extortion is wrong. These things I’ve just detailed above are all policing issues that create and maintain an adversarial culture between police and the public. That’s not how it should be in any country, but especially in the United States of America. We need police to be a part of the communities they’re patrolling, and there are a lot of things we can do that will improve accountability for police and civilians alike while also making interactions between the two much safer for everybody. 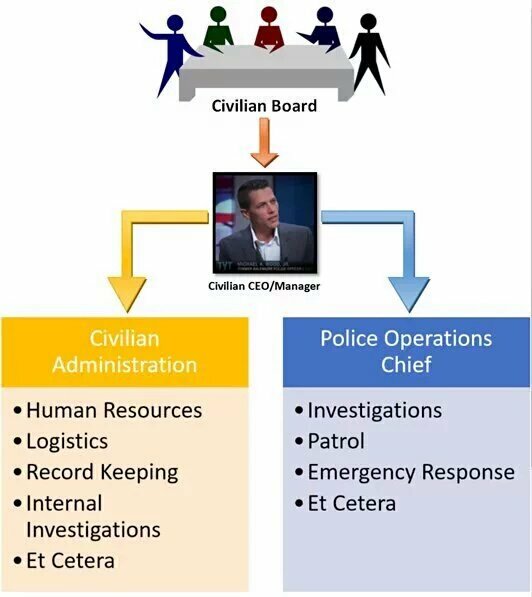 The Civilian Led Policing model would be a fantastic improvement of relations between police and their communities, bringing equal accountability and justice to a system that needs both. The first and best idea to help in this regard is Civilian-Led Policing. This is a new program that I endorse which I believe will be able to help bridge the divide between law enforcement and their communities. I encourage you to check it out. Along with Civilian-Led Policing, I’d like to end the practice of the federal government incentivizing criminalization of illicit drugs (which, again, I believe should be decriminalized anyway) by ending the issuing federal money to state and local law enforcement based on their ability to arrest people for non-violent drug offenses. Instead, I’d like to use that same money to incentivize state and local law enforcement to hire officers who live within the very communities they will be policing, or by having officers move into those communities. This can be done in a variety of ways, but the end goal will be to have as many police living within the community they patrol as possible, which I believe will create a bond between police and their communities and drastically change the adversarial-policing dynamic we’re witnessing today. I will work to permanently ban the process of Civil Asset Forfeiture without an accompanying criminal conviction nationwide. In regard to traffic citations, I will advocate for fines to be set on the basis of the recipient’s ability to pay, so that traffic fines will still maintain whatever punitive effect they may have of discouraging poor driving, but not victimize our most vulnerable people. I believe that if any state or municipality needs more money to pay their bills, they should get it the honest way: through taxes approved by their constituency. If they can’t do that, then they should do without the money until such a point that they can. Allowing traffic citations to be used to pay government bills quickly turns into “highway robbery,” as governments continually increase the fines, fees, and penalties associated with the citations, and hold your driving privileges hostage until you can pay. And it also increases the motivation for governments to focus their policing not on public safety, but revenue generation. This usually leads to ticket quotas, which are against the law in California – and should be nationwide. But regardless of their legality, police in California still do it. When they get away with it, it’s usually by calling the quota a “guideline,” for example, but if you’re a police officer and you don’t write very many tickets for a few weeks, you will definitely end up getting a visit from your superiors. If we want to live in "the land of the free," then the way we handle policing in this country needs to undergo a paradigm shift. We can't expect them to police themselves. All civil and criminal penalties enforced upon Americans should be in an effort to make society safer and/or more just. Period. No government should rely on revenue from punishments to operate, because as I just showed, it leads directly to more, heavier punishments regardless of whether or not they benefit society itself in any way. There are a few ways to combat this: One could be by allocating the money earned in citations to be used outside the system, such as for schools; but the danger to this is the government could cut funding for schools, like the state of California did after they brought in the California Lottery in 1984. Another way to combat it would be to force the money, by law, to be used to fund things that are currently not being funded, but should be. Maybe starting an account with this citation revenue to fund new business startups could be a smart move, for example. But something has to be done to remove the government’s incentive for targeting its populace like this. I believe there needs to be justice whenever anyone needlessly harms another person in our country, whether the offender is a police officer or not. I believe that positions of power should require a higher standard of behavior, not a lower one. If as your congressperson I’m ever charged with a crime, I expect to be prosecuted to the fullest extent of the law, not just let off as often happens with government representatives, employees, and the very wealthy. It’s wrong. If law enforcement officers who are charged with a crime are prosecuted effectively, they should be convicted at roughly the same rate as anybody else. So, when I’m elected, I will do whatever I can to help Tennessee congressperson Steve Cohen get his law passed through congress that mandates independent prosecution of law enforcement officers for police shootings. I’d like to take that a step further and have independent investigators involved in some capacity as well, which should not only remove bias from the investigators, it would bring the investigation in line with the officer’s Garrity rights, which means the officer would be allowed to be investigated without conflict. In any truly free country, this is a question that we must be able to easily and quickly answer. Police are tasked with enforcing the law, so when they break the law, who do we turn to? I believe that all good law enforcement officers will welcome the fair trials of officers who needlessly harm the public and, as a result, make their jobs more dangerous. The danger of the justice system failing victims of police abuse is that, ultimately, victims can be expected to seek justice on their own. It’s human nature. And a culture of accountability will also make it easier for the good officers to displace the bad ones throughout the American law-enforcement community. Jailing bad police officers would be a good start toward fixing this issue, but ultimately there needs to be a change in how police are trained in our country. Salt Lake City is proving to be an example of how much better it can be done. Then-Chief Chris Burbank, back in 2013, explained how and why he’s attempting to change the police culture in Utah’s capitol city. 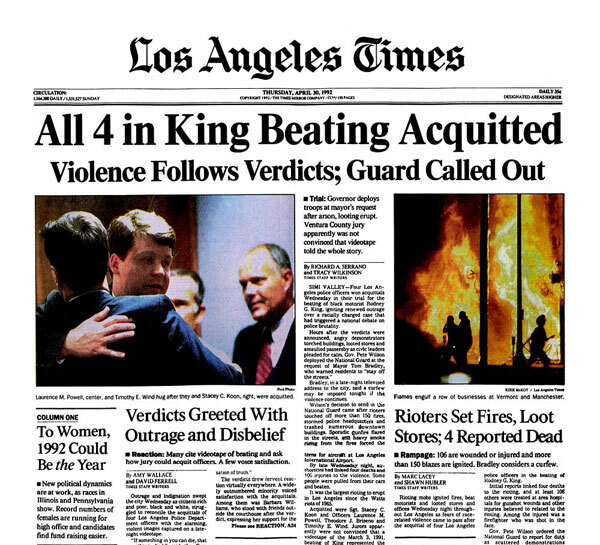 His focus was on ending adversarial policing, because he believed it makes everyone less safe, including his officers. Although he ended up being fired by the mayor (due to poor handling of sexual-harassment complaints from within the department) in June of 2015, his transformation of policing in the city was already nearly complete, as his department was receiving new training in de-escalation, including a concept they refer to as “giving ground.” As a result of these new policies, (as of my writing of this section, in July of 2017) the Salt Lake City Police Department hasn’t killed anybody since 2015. Here’s a video clip of an SLCPD officer practicing these de-escalation techniques to successfully arrest a man with a knife, even though the chief said he would’ve been technically justified in shooting and killing the man. This is how policing needs to be handled in our country. We can do it much better than we are. Police are not our enemy, and we are not theirs, but it’s obvious that, somewhere along the line, many officers and civilians alike have lost their way. It’s time to remind everybody that we are all in this together.